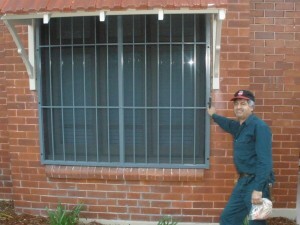 North Shore Aluminium specialize in the manufacturing and installation of high quality custom Steel Security Screen Doors in Sydney, window grilles and gates. All our steel products are fully welded, hot dipped galvanised and then oven baked powder coated. Our doors are installed within it’s own steel frame maximizing security but still allows the door to be removable from the frame only in the fully open position. 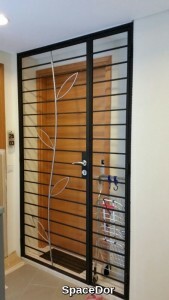 Our Steel Security Screen Doors Sydney are fully welded and include welded hinges, custom steel frame, and a keyed Jackon deadlock in either a brass, gold plated or satin chrome finish. All internal bars are full solid steel not hollow, like used by some of our steel door competitors. The doors come with a anti-jemmy bar down the lock side for extra added security and we offer the option of a kick plate along the bottom of the door for no extra charge. We have a variety of different mesh options to stop insects from entering, fibreglass, paw proof mesh, aluminium one way mesh, aluminium insect screen mesh and stainless steel mesh to list a few. Our steel window grilles are fully welded and all internal bars are full solid steel not hollow, like used by some of our steel door competitors. They are hot dipped galvanised and oven baked powder coated. Installed with security screws for extra security, we offer again a wide variety of standard and custom designs to choose from.